Every day a lot of doubts arise about how to deepen our understanding of the challenges a Product Owner faces. 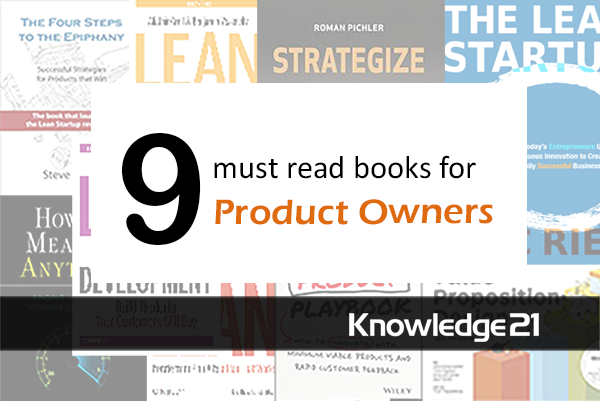 Speaking about this, we’ve selected a list of 9 books which every Product Owner should read. In fact, they help to better understand the role and responsibilities of a Product Owner. Lean Startup: the Lean Startup methodology revolutionized the way of building a business, making it cheaper and faster, through the validation of hypotheses. Considering this, Eric Ries describes a plan to execute the fundamental principles of Lean Startup in any environment. Running Lean: find out how to create a systemic process for quickly validating new product ideas and increasing your chances of success. How to Measure Anything: the author explains how to measure things in your business which have previously been considered “immeasurable” – this including client satisfaction, organizational flexibility, risk, and technology ROI. Value Proposition Design: the authors explain how to make use of a “Value Proposition Canvas” for the purpose of developing, test, launch and manage products and services which adapt to the client’s necessities. Lean Product-Playbook Innovate Products: in order to help you to develop the right product, this book is a step-by-step guide based on using Lean Startup principles. Strategize Product: Roman Pichler provides essential guidelines for creating strategies and roadmaps. The purpose is to increase your chances of creating successful products in the digital era. Lean Customer Development: avoid wasting time and money developing a product or service that no one needs, through open interviews and fast research techniques. Lean Analytics: the greatest risk you run is building something no one wants. Regarding this, the authors provide a practical approach to find the right clients and decide what to build. The Four Steps to the Epiphany: Steve Blank describes a step-by-step strategy which has been broadly tested by entrepreneurs in various countries in order to structure sales, marketing and the business development of a new product or company. In summary, these books are essential for making your work on managing products even more strategic, effective and successful. You’ll find them filled with valuable tips and insights which are bound to bring you useful knowledge for your work as a Product Owner. Learn more about the work of PO in our posts. Do you want to do our CSPO training? Check out our upcoming classes. Thanks for the list! I really liked The Lean Startup. I would like to add another title to the list: Treasure Roadmap. The book offers a set of tools emerging from lean start-up, design thinking, and agile software development that are revolutionizing how new ideas are created, refined, and brought to market.